James Hougas, III, MD, FAAFP joined the University of Minnesota St. John’s Hospital Family Medicine Residency in 2017. Before this, he served on active duty with the United States Air Force for five years after residency. 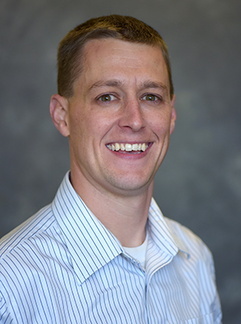 His assignments included outpatient practice at Malmstrom Air Force Base in Montana, residency faculty and full spectrum Family Medicine at Offutt Air Force Base in Nebraska, and deployment to Afghanistan, Qatar, and elsewhere. He is interested in infectious diseases, antimicrobial stewardship, trauma care and systems, office based procedures, physician leadership, and colonoscopy. He is also an instructor in Advanced Trauma Life Support (ATLS) and Advanced Life Support in Obstetrics (ALSO). Hougas III, J.E. (2019). Teaching an old dog new tricks: Experiences of a junior faculty teaching colonoscopy to an experienced faculty learner. STFM Messenger. Blegen, C.D. and Hougas III, J.E. (2019). Hypercholesterolemia. In F.J. Domino, The 5-Minute Clinical Consult (28th ed.). Philadelphia: Lippincott, Williams, & Wilkins. Broszko, C.M. and Hougas III, J.E. (2019). Meningitis, Viral. In F.J. Domino, The 5-Minute Clinical Consult (28th ed.). Philadelphia: Lippincott, Williams, & Wilkins. Fahey-Ahrndt, D.J. andHougas III, J.E.(2019). Protein C Deficiency. In F.J. Domino, The 5-Minute Clinical Consult (28th ed.). Philadelphia: Lippincott, Williams, & Wilkins. DeSpain, S.M.,Hougas III, J.E.(2019). Prostatic Hyperplasia, Benign. In F.J. Domino, The 5-Minute Clinical Consult (28th ed.). Philadelphia: Lippincott, Williams, & Wilkins. Haroldson, T.A. andHougas III, J.E.(2019). Vocal Cord Dysfunction. In F.J. Domino, The 5-Minute Clinical Consult (28th ed.). Philadelphia: Lippincott, Williams, & Wilkins. Hougas III, J.E., Bruneteau, R.J., & Varman M. (2011). Mycobacterium goodii infection of skin graft in an immunocompetent child. Infectious Diseases in Clinical Practice, 19(2), 146-147. Wellman PW (2017, January 27). Interview with James Hougas. Fraternization fears threaten Resolute Support’s Feline Force Protection Program. Stars and Stripes. Hougas III JE (2014, February 7). Flu Vaccination: It’s not too late! Global Guardian, p. 5. Hougas III JE (2014, January 21). Giving good feedback: Essential leadership for growing Airmen. Global Guardian, p. 2, 4.